Notifies you of new software bundles. Is there a better alternative to Mac Bundle Watcher? Is Mac Bundle Watcher really the best app in Internet Utilities category? Will Mac Bundle Watcher work good on macOS 10.13.4? Mac Bundle Watcher is a free menubar app tracking over 20 Mac bundle sites (MacHeist, TheMacSale, etc.) 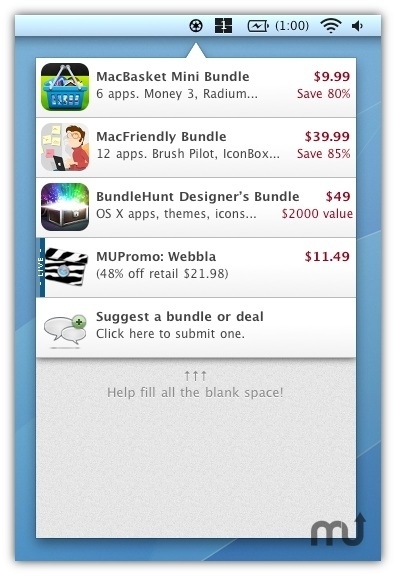 and daily deals on discounted Mac software (MacUpdate Promo, macZOT, …). You can see details about each new Mac Bundle and other deals & discounts on Mac software by clicking on the Mac Bundle Watcher icon in your menubar.